ISRI would like to thank everyone that stopped by our booth at the 11th Annual E-Scrap Conference – the largest yet! It was great to greet old friends and see new faces. We welcome all new ISRI members who signed up this week and look forward to working with you for years to come. Please do not hesitate to contact us at any time with questions or how you can take advantage of the many services ISRI offers. Feel free to email ISRI Director of Membership Tom Crane or call him at 202-662-8536. We hope you all had a safe trip home, particularly those on the East Coast who faced significant travel delays. ISRI would also like to thank those who helped sponsor Monday’s opening reception, which ISRI hosted: AERC Recycling Solutions; Electronic Recyclers International, Inc.; HiTech Assets, Inc.; MRP Company; Regency Technologies; and Wistron. And finally, a special thanks to Resource Recycling for being such wonderful hosts and making this event possible. We look forward to seeing everyone next year in Orlando, October 22-23. Over the last decade, electronics recycling has grown into a more than $20 billion industry that employs more than 45,000 employees in the U.S., with still a great deal of potential for further growth. 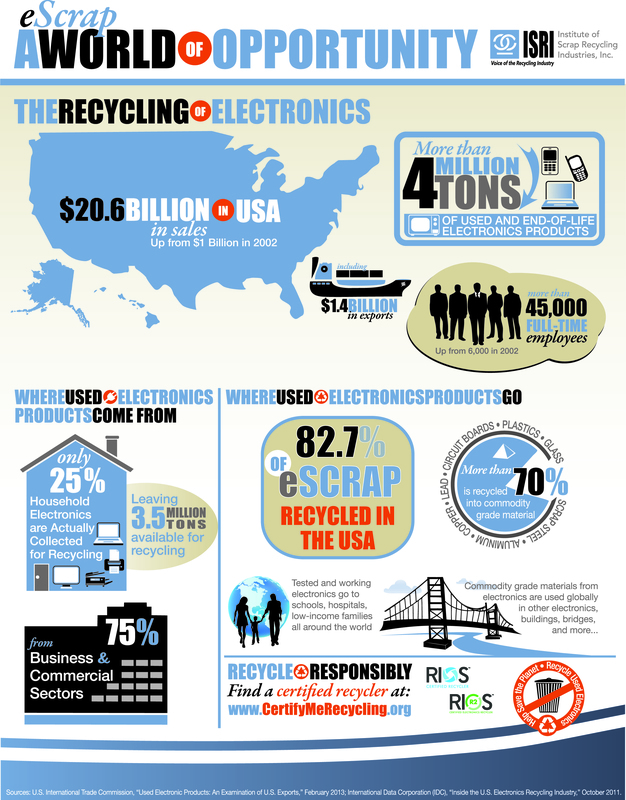 ISRI has released a new infographic that illustrates how far the industry has come and what the future could hold, showing where used electronics come from and where they go, including how more than 82 percent of electronics collected are recycled right here in the U.S. Feel free to download the infographic and share with your customers and others. 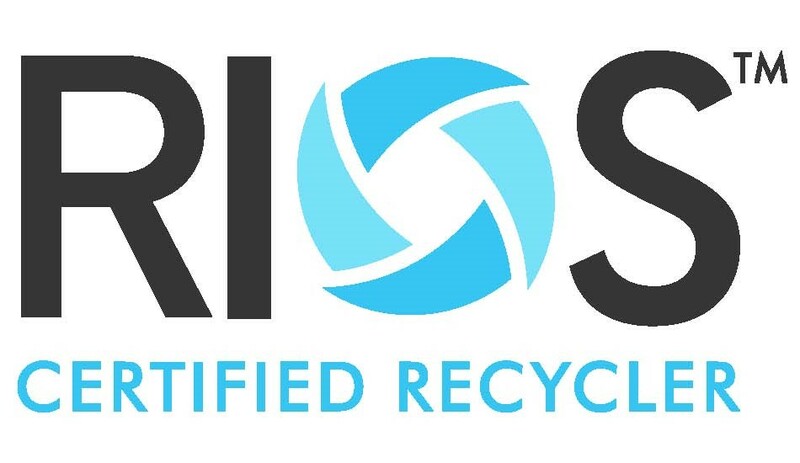 The course, ISRI Electronics Recycling Educational Program: How to Maximize Value in Reuse, is designed to help electronics recyclers exploit the reuse potential of used electronics equipment. Experts in reuse, refurbishment and resale will address a variety of opportunities to maximize value – including returns, repair, wireless devices, non-traditional equipment and components. Attendees will have the chance to learn from industry leaders who have built a profitable business in each of the key areas available to optimize the reuse market. This ISRI short course will include a handout book of all the presentations. The program will take place, Tuesday, September 10, from 1:00 to 5:00 pm in the Celebration Room. Separate registration is required. The fee is $125 for ISRI members and $150 for non-ISRI members. Attendees will be issued a “Golden Ticket,” good for a free spin on the trivia wheel at the RIOSTM booth, #709, with the opportunity for valuable prizes. For more information, contact Eric Harris or stop by booth #707. Registration is now open for the Institute of Scrap Recycling Industries’ 2013 Convention and Expo. Held in April, the ISRI event presents a unique networking and learning opportunity for electronics recyclers. Attended by thousands of people, the event draws together high-level recycling executives, innovators and other people on the front lines of the recycling industry. Last year’s conference featured several workshops and discussions focused solely on electronics recycling, such as an examination of national Electronics Stewardship agendas, a discussion of exports of commodities, and the importance of certification in electronics recycling. The conference last year also included an international summit which drew together high-ranking officials from foreign environmental ministers and the United Nations. Another valuable discussion, many attendees said, were workshops dealing with CRT handling and legislative efforts. Because the convention is open to recycling of all commodities – metals, plastic, glass, etc. – it’s an opportunity for cross-disciplinary exchange of ideas. Vendors from around the world bring the latest recycling technologies and demonstrate new ideas and innovations, all geared toward developing safer, more efficient recycling methods and processes. The convention is open to the general public; students with an interest in the recycling industry are also encouraged to consider attending. This year’s convention will be held in Orlando at the Orange County Convention Center. For more information on the convention, visit www.isriconvention.org. The event runs from April 9-13, 2013. In mid September, the city and borough of Juneau, Alaska held a large, free community electronics recycling drive. Public works director Kirk Duncan said residents streamed steadily through the dropoff site, bringing in electronics they’d had stockpiled for years and sometimes decades. In all, the trial event collected 15 tons of material. What results like this prove is something that electronics recyclers have known for a long time – American stockpile obsolete electronics because they don’t know what to do with them. The U.S. Environmental Protection Agency estimates that in 2009, an estimated five million short tons of products were in storage, with CRTs (monitors & TVs) being stored at the highest rates. These events target that crucial residential sector – consumers, according to the International Data Corporation, comprise most of the new electronics industry but only 25% of the electronics recycling industry. We have a general idea that throwing out old electronics is a bad idea. Perhaps it’s an acknowledgement that such items don’t belong in landfills, or the mentality that many products, once so expensive, must retain some value when they reach the end of usefulness. Still other people don’t know how to handle old electronics, which doesn’t fit in the trash can and won’t be picked up by sanitation workers if it’s left at the curb. And so the old TV goes into the attic or the basement, where it sits for a while. Sometimes it’s joined by an old computer monitor or an old computer tower, and then, after a while, another TV set. Finally, after a while, the average American household has developed a sort of private e-scrap stockpile, gathering dust and taking up space. While many retailers operate voluntary recycling drop-off programs, they often must charge for data removal or for CRTs. So, when a free government-sponsored collection is announced, it’s understandable why all of these electronics start coming out of the wood works. Global electronics recycling market to reach $9.8 billion? A new market report, ” E-Waste Recycling and Reuse Services Market – Global and China Scenario, Trends, Industry Analysis, Size, Share and Forecast, 2010 – 2017″ published this week by Transparency Market Research predicts the global electronics reuse and recycling market will reach $9.8 billion in 2012 and could nearly double within five years. While the full report is available for a fee, a summary is available HERE.